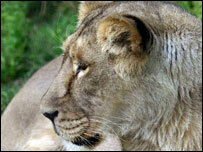 A Chinese zoo worker has been badly mauled by three lions on his first day at work. Unfamiliar with the layout of Shanghai Wild Animal Park, Zhang Huabang accidentally entered the lion area, where he was immediately attacked. Mr Zhang is still in a critical condition in hospital, and is expected to take at least a year to fully recover. The park has announced an internal investigation into the incident. When the 34-year-old began work on Tuesday morning, his supervisor issued some safety instructions, according to the Shanghai Daily News. But later in the day, Mr Zhang mistakenly wandered into the lion area. A look-out spotted what happened next, and immediately sounded an alarm. The lions were reportedly hosed down with water and given a chicken to distract them. But Mr Zhang was seriously mauled by three of the animals, and rushed to hospital. "We conducted surgeries on his legs, chest and head, as well as giving him a blood transfusion," Dr Wang Tao is quoted as telling the Shanghai Daily News. "When Zhang was brought to hospital, he was in a coma," he said. If no infection sets in, doctors hope to begin plastic surgery in about five days, the newspaper added. "We're very sorry to see such events happen, and certainly we'll pay more attention to the safety education of our staff," Shen Jianguo, an official at the park, is quoted as saying. Shanghai Wild Animal Park houses more than 10,000 animals, of about 200 different species. Among them are imported giraffes, zebras, leopards and white rhinoceros, as well as some endangered domestic animals such as giant pandas, golden monkeys and tigers.